Bootie LA returns to the Regent Theater to pay mashup tribute to two divas that help make pop music what it is – it’s Beyoncé vs. Rihanna Mashup Night! They’ll get mixed and mashed with anybody and everybody all night long! No genre or era is safe! Only $5 before 10 PM! 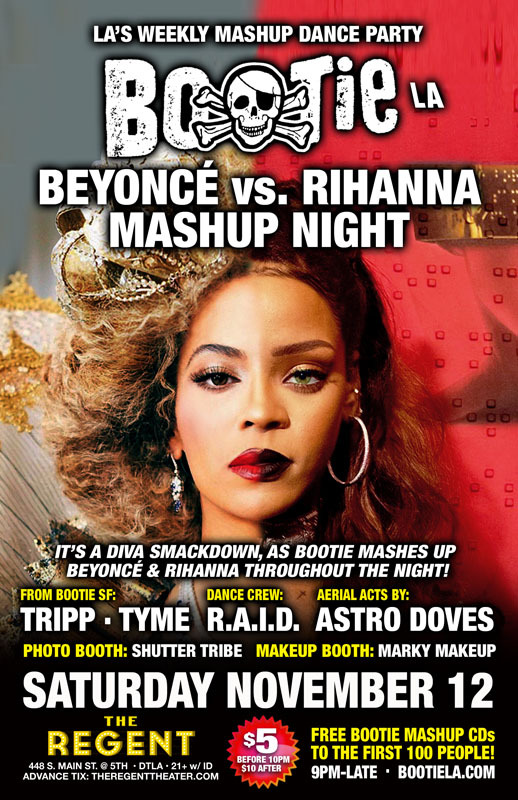 Beyoncé and Rihanna, two queens of the pop charts, face off in an epic mashup showdown, with Bootie San Francisco DJs Tripp and Tyme taking over the Regent as they mash up the greatest songs Beyoncé and Rihanna have ever created, giving them the Bootie treatment and mashing them up with anybody and everybody! Astro Doves will perform aerial silks high above the stage, and resident dance crew R.A.I.D. (Random Acts of Irreverent Dance) performs a divalicious Midnight Mashup Show as well as their normal go-go insanity, while Marky Makeup makes you up flawless, and Shutter Tribe will be on hand to capture all the fun! All this, plus FREE Bootie mashup CDs for the first 100 people through the door! Launched in 2003 by San Francisco DJ duo A Plus D, Bootie was the first club night dedicated solely to the then-burgeoning artform of the bootleg mashup — and is now the biggest mashup event in the world, with regular parties in several cities. Winning various nightlife awards for the past 13 years, Bootie celebrates pop culture both past and present, keeping your brain guessing and body dancing with creative song combinations. Mixing and matching every musical genre, era, and style into one big dance party, it’s a place where everyone is welcome. And with free mashup CDs given away like candy, Bootie provides the soundtrack for the A.D.D. generation.